Jvct sent these in just a little while ago. 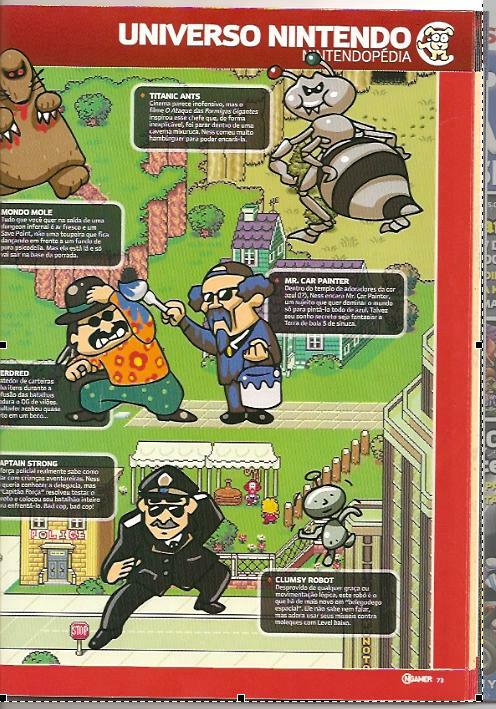 They’re scans of EarthBound stuff from NGamer Brasil. I don’t have any more details than that, but that’s okay. 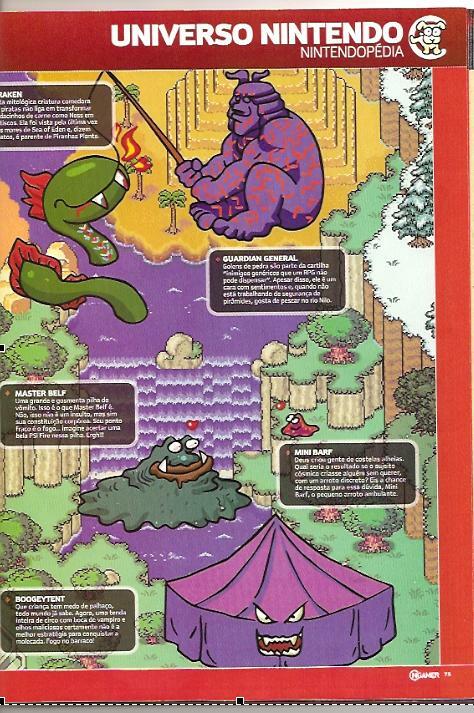 I really like all the original artwork and the interesting map/sprite-related editing. 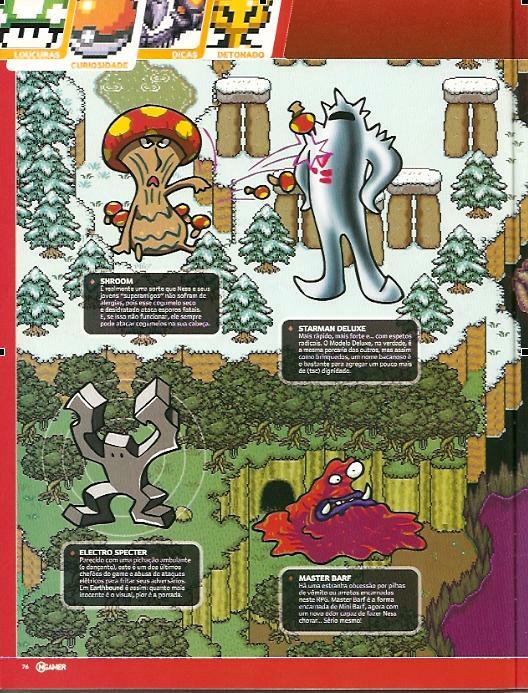 I also have a few other EarthBound scans from magazines from around the world and they really do a lot of neat stuff like this. They have something fun to them that most gaming magazines around here seem to have lost. Wow, that’s some nice design! I especially like how they made all their own artwork. Stupid Mexican magazines! they never did any Earthbound articles. Heavily Armored Pokey? Evil Mani Mani? great art, though. i like how they merged the maps together! Titanic Ants: Cinimas may not seem dangerous, but the film “Attack of the Giant Ants” inspired this boss that, in an unforgettable form, waited inside a -some adjective- cavern. Ness ate a lot of hamburgers to beat this guy. Mondo Mole: Everything that you want in the exit to an infernal dungeon is refreshment and a save point, and not a mole that just dances around in front of a psychadelic background. But, he’s there and you can only leave if you’ve beaten him. Mr. Car Painter: Inside of the temple of the worshippers of the color blue, Ness encounters Mr. Car Painter, who wants to dominate the world just to paint it blue. Maybe his secret dream is to dress the world up as (couldn’t read this last part). Everdred: (Lots of this was cut off) Something about wallets, a battle, boss of villains, and things ending almost ending up with him dead in an alleyway. I’ll post the other pages soon. Haha, the guardian digger one is great! Sorry about how rough these translations are, I’m throwing them up on the fly. Guardian Digger: Wonderful huge guys like this one pop up in below the Dusty Dunes Desert. Every one of them states that there are other malignant moles, but in all reality there’s only one multi-tasking mole. Oh, what solitude does to a boss. Trillionage Sprout: Irresponsible use of fertilizers can often cause problems. This boss is just a normal, obscure sprout that grew and gained a [something bad] because of chemical products. And its innocent eyes can paralyze. Evil ManiMani: If an oscar existed for Villains, (not completely sure about the following, its a bit blurry) it would look like the Evil Mani Mani statue, the statue with horns. The problem is that this statue has the ability to drain all of your PP and shines like a [something] from the 80s. Plague Rat of Doom: Monsters like the Bahamut and Ifrit are for weak games like Final Fantasy. The monsters that really freak you out are ones like this one, the “Plague Rat of Doom”. Leptospirose (a deadly disease) is refreshing compared to this guy. Dept. Store Spook: (Man, this one was really blurry) [What can be said about this guy] is that he is the owner of a Department Store that threatens in the following form: Gwaaargh, Gwaaargh! This store will be your tomb!” (I probably totally misread the next line, haha, but it looked like:) Spacial Capitalism is really much more aggressive. Kraken: (This one is also cut off, bummer) This mythological creature … something like is so poweful that pirates don’t even notice before they’re in tiny peices of meat would be able to eat Ness in [something]. She was last seen in the Sea of Eden and is said to be related to Piranas. Guardian General: Rock Golems are part of the general group of generic enemies that an RPG can’t be without. This aside, he’s a dude with feelings and, when he’s not working as a pyramid guard, loves to go fishing in the river. Master Belf (haha): A large, gaseous pile of vomit. That’s what Master Belf (hehe) is. Wait, but that’s not an insult. But his constitution [something]. His weak spot is fire… Imagine PSI Fire lighting this guy up! Yuck!!! Mini Barf: God created people out of extra ribs. What would the result be is the cosmic being created someone without meaning to, accidently using something gross? The response to this question is this guy, Mini Barf, the nasty smelling belch. Boogeytent: Children are scared of clowns, as everyone knows. But now, a tent with a vampire’s mouth and mean eyes is not the best place to take the kids. Fire in the hole! Shroom: This is where it would be good for Ness and his young “Super Friends” to not have bad allergies, as this dried and dehydrated mushroom attacks with fatal force. And if that doesn’t work he can throw mushrooms on your head. Starman Deluxe: Faster, stronger, and with radical aspects, The Deluxe Model, in all reality, (it gets really blurry here) is the same old deal as all the others, and like toys, his cool name is the only thing that makes him a little bit cooler than the others. Electro Specter: With the appearance of a [something from a dance club? ], this is one of the last few bosses (I don’t know what it says here, too blurry). In Earthbound, that’s just how it is. The more innocent it looks, the worse the fight. Master Barf: There is a strange obsession for belches and piles of Barf in this RPG. Master Barf, now with a new stench that can make Ness cry. Seriously! Heavily Armored Pokey: Behold the big boss of the game. The lame, fat neighbor of Ness decides to use alien technology to start a beastly battle between neighbors. This is the first enemy in an RPG that can be destroyed by faith (Guess he clumped the last couple bosses together, lol). Diamond Dog: After putting out the fire of Carbon Dog, this boss transforms into Diamond Dog, hard to beat. Too bad that the destruction of this pure race doesn’t mean anything to the kids. Ness’s Nightmare: The first evil version of the Oscar decided to avenge the death of his poor friend, Evil Mani Mani. He doesn’t have much mobility or acrobatic tricks, but [something] makes all the difference. 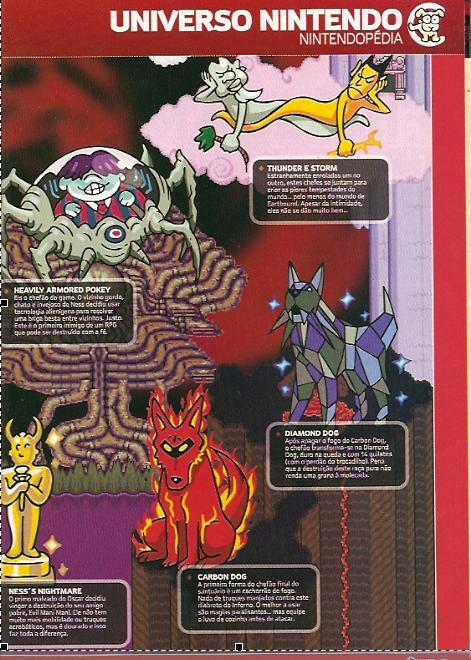 Carbon Dog: The first form of the final boss of the sanctuary is the Great Carbon Dog. No tricks work against this [something] from hell. The best thing to do is use (I think it says:) paralyzing magic… but be sure to equip something to keep you from being cooked before attacking. @TragicManner: I think the reason he did that with the final boss was becuase Pokey technicly summons Giygas using that “Alien technology”. I’ve always wondered why publications get “Heavily Armed Pokey” wrong… “Armored” has a whole two extra letters. Holy cow! Unprecedented!!! Great find, Tomato! 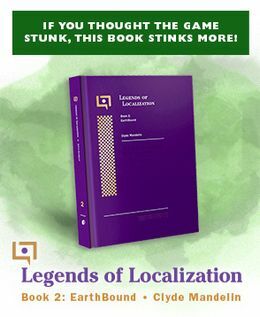 I’m going to translate some of the stuff TragicManner couldn’t read, or missed out. …perhaps his secret dream is to make the Earth dress up as a billiard 5-ball. Police force really knows how to deal with adventurer kids. Ness wanted to take a tour around the police station, but “Captain Strength” [sic] decided to tess the lad and made him fight his entire troop. Bad cop, bad cop! Devoid of any graceful or logical movements, this robot is the latest technology in “space thingamajigs”. It can’t even speak, but it loves to shoot its missiles at underleveled kids. …this boss is a sprout of some obscure thing, which became oversized and grew a huge pair of lips because of chemical products. If there was an Oscar for villains, that would be the Evil ManiMani, the horned statuette. But don’t keep one on your shelves, as it’s an ornament capable of draining all your PP (psychic energy), and it shines like a lampshade from the 80’s. [This] mythological pirate-eating critter doesn’t mind turning little [pi]eces of meat, like Ness, into [sna]cks. It was last seen [on the] seas of the Sea of Eden, and, according to [ru]mors, it’s a relative of Piranha Plants. …like with toys, a cool-ish name is enough to add some more (tsk) dignity. Looks like a walking (or dancing) grafitti; this is one of the last bosses in the game and he abuses electric attacks to fry his enemies. That’s how things are in Earthbound: the cuter it looks, the meaner it hits. Here’s the game’s final boss. Ness’ fat, boring and envious neighbor decided to use alien tecnology to put an end to a silly neighbor quarrel. I swear [I think that’s what it says, “Juro”?]. This is the first RPG enemy who can be destroyed through faith. After putting out Carbon Dog’s fire, the big boss turns into the Diamond Dog, hard to beat and worth 14 karat (forgive the pun) [sic]. Too bad that beating up this purebred gives the kids no money. Oscar’s evil cousin decided to avenge the destruction of his poor friend, Evil ManiMani. He doesn’t have more mobility or acrobatic tricks, but he’s golden. That changes EVERYTHING. …please wear oven mitts before attacking. RAWR, I wanna learn portuguese, dang it. i see that, even though this review of things ACTUALLY GETS PAST THE FIRST TOWN, I still see that they mess up a few things (not surprising, considering the other EB reviews). like the porky thing. and the master Belch thing. but that’s okay. nice translation, you guys! Not only are the original art pieces really cool and reminiscent of those old NP issues, but NGamer even mixed the maps in the background extremely well so that they merged pixel-perfect. They did a very good job with both. Man, I wish more magazines went out of their way to do cool things such as that nowadays. a abóbora da minha prima está de cor vermelha e febre,alem de não crescer,o q eu faço,me digam!!!!!!! I’m from Brazil but it’s too damn hard to read it, if possible I’ll try to translate it later. The artwork is really cool! I wish there was a high resolution scan however. the artwork on that was so spectacular I ended up saving it all on my hard drive. Mr. Carpainter: DIE, EVERDRED, DIE!!! I like how Diamond Dog looks so proud!!!! I guess I would be too if i was made out of diamonds.